This article will look at how high frame rate (HFR) may effect cinema exhibition and why it is a very important development. The first thing to understand about HFR is its major importance to exhibition. As has been demonstrated by the moves to sound, colour, widescreen, digital audio and stereoscopic 3D, exhibition is always looking for a point of difference. Most importantly, one that can only be seen in cinemas. HFR is suited to fill this need for several reasons. For a start, HFR works well for 2D as well as 3D, with problems with current 3D greatly improved by HFR. As HFR in the home is problematic, it is likely to take long time to appear in the hem, thus giving exhibition a reasonable window where HFR can be a cinema- only experience. There is demonstrable demand for HFR as exhibitors doubled the number of HFR screens in the course of the last year, as cinema goers clearly want HFR when offered it. Most digital cinema installs (Series 2 Projectors onwards) can do 48/60fps 2D HFR today. By way of contrast in the home, DVD cannot support HFR and BluRay (BD) support is questionable. (BD is supposed to support HFR at 1280×720 as a standard, but this is not implemented on many BluRay players). The industry would not consider it a serious or reliable way to distribute films. The implementation of HFR as a domestic SMPTE standard would most likely take a very long time, especially after the efforts of doing it with 3D failed. Optical discs as a distribution medium for HFR content is anyway in doubt with streaming (Netflix et al) coming on strong, meaning that such a standard may never happen. Streaming HFR, like 4K is not really viable as it requires too much data and is too limited a market to really bother. HFR and 4K for the home are in a limbo. The result is that HFR in domestic and home is a long way off while in cinema we have it today. In its first cinema appearance HFR was universally slammed by “Movie Critics”, while the long term movie industry community appeared uncomfortable with the ‘change’ that it represented. Hobbit 1 was too much ‘change’ all at once for cinema aficionados. Yet this changed when it came to the second Hobbit films. “It was interesting to try to interpret what people’s reaction was,” he says. He concluded the problem was that the image looked like HD video, and was simply sharper than people are used to in cinema. “So what I did is work that in reverse,” says Jackson. “When I did the color timing this year, the color grading, I spent a lot of time experimenting with ways we could soften the image and make it look a bit more filmic. Not more like 35 mm film necessarily, but just to take the HD quality away from it, which I think I did reasonably successfully.” ?? “The film speed and the look of the picture are almost, kind of, two different things,” he says. Despite this initial backlash, Warner Bros’ President of domestic distribution Dan Fellman claims that HFR screens “overperformed” on The Hobbit: An Unexpected Journey. This is backed up by the fact that exhibitors installed near double the number of HFR screens for The Hobbit: The Desolation of Smaug due to high demand – US Hobbit 1 was 426 screens in HFR, while for Hobbit 2 demand raised total HFR screen count to 812. Add to this that HFR screens have a higher screen average box office takings and it is clear that patrons want HFR. HFR is particularly popular with younger audience, in part due to 60fps being the norm for computer and console game playing. HFR 48/60fps compared to 24fps equates to cinemas switching to digital audio (Dolby, DTS, SDDS) from analog-SR (the squiggly lines on the side of the film print). The transition from Analog-SR to Digital Audio is universally accepted due to clear sound that is easier to listen to, i.e. I can hear more details. The same way the switch from 24fps to HFR can be expected to be universally accepted due to clearer visuals to see, i.e. I can see more details. How Did Hobbit 1 Get This So Wrong? The Hobbit: An Unexpected Journey pushed too many bleeding edge aspects of digital cinema, leading to the critics calling it hyper-real and having the uncanny-valley effect. It pushed the grading too much making objects look plastic. As mentioned in the Variety quote, Hobbit 2 fixed this, creating much darker more filmic image results that critics prefer. Hobbit 1 also pushed resolution too much (Newsflash – digital at 2K is 1080 lines flat, while 35mm film is at best 850 lines for a typical theatrical release print.) Hobbit 2 fixed this and brought dow/blurred the resolution to match film results and created a look that was more like what the critics prefer. These issues have nothing to do with HFR but were the main criticisms of Hobbit1 and were all blamed on HFR. HFR in 3D is the main driving force currently; 3D needs HFR to make the “illusion of 3D” less stressful to viewers. At 24fps the brain has to work too hard to fill in the gaps left by such a slow frame rate, reducing the ability to absorb the story. This has lead to a dip in 3D popularity in mature markets as patrons vote to see 2D over 3D versions of films. HFR (plus decent brightness) for 3D leads to a much more enjoyable 3D result making it nearly as easy to watch as 2D, which is still not perfect but much better. Is HFR then suited to all films? The answer is clearly: “No.” Like 3D, HFR is suited to certain films, primarily actions films, films with a lot of camera movements and documentaries. It will most likely become the standard as time goes by and HFR work-flows (2D) become common place. Currently, from what I have been able to find, The Hobbit and Avatar films are the only publicly known HFR productions (both in 3D). This will most likely improve soon as producers see statistics on HFR popularity by movie goers on The Hobbit. This also creates an opportunity, as HFR can only be seen in cinemas, so patrons who wait for the film to come out on DVD or television will not see it at its best, and are thus more likely to go to the cinema. It is also much harder to pirate a film with HFR intact. We still need a tentpole 2D HFR film to arrive to make the public aware of HFR (in 2D) outside of the 3D world. SMPTE-DCP standards need to be implemented (software upgrades and tested, hopefully this year), making a wide release of a 48/60fps HFR 2D film available on current digital install base. Most can do it today but don’t know it. So what ca exhibition do to help? Exhibitors need to get SMPTE-DCP upgrades and certification as soon as possible. Make noise to your integrator that you want the latest software upgrades NOW. All DCI players connected to a Series 2 Projector can do this today if you are on the latest software. Also, promote the use of HFR. 48 or 60 fps – Which Will Win? 60fps looks much better than 48fps; if we make the change we only go half the way by settling on 48fps. The 48/60 decision is all about deliverables and making the product available to other markets (25/30 fps = TV broadcast standards, DVD, BluRay). 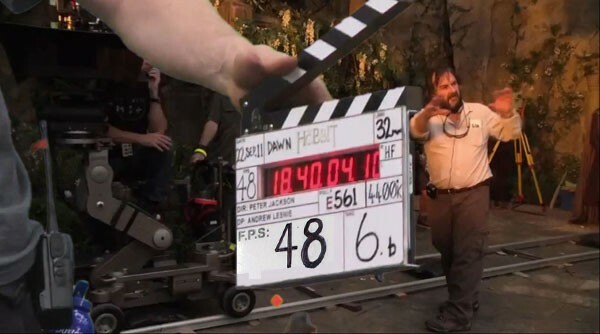 The Hobbit was shot in 48fps as this was the only option at that time. The Hobbit 24fps release was every second frame of left eye of the 3D print/DCDM. Easy! Current digital cinema players could only deal with 48fps (and only just!). The next Avatar is expected to be in 60fps as by that time SMPTE-DCP at 30fps “should” be supported. Going from 60fps to 24fps deliverable does not produce acceptable results. In conclusion, the advantages of HFR as a key differentiator for cinema from other home platforms is indisputable. While the first HFR received criticism, this was largely fixed in the second and as we saw, was mostly not directly attributable to HFR but to other factors. With Avatar and other HFR productions in both 3D and 2D coming to cinemas soon, the time is now to upgrade your system if you are an exhibitor. ?